CATBALOGAN, Samar – The Provincial Government of Northern Samar and the 8th Infantry (Stromtroopers) Division, Philippine Army through the 803rd Infantry (Peacemaker) Brigade spearheaded the Joint Declaration of Northern Samar as Peace and Development Ready Province (PDRP) on December 4, 2014 at the Farmer’s Training Center, University of Eastern Visayas campus, Catarman, Northern Samar. 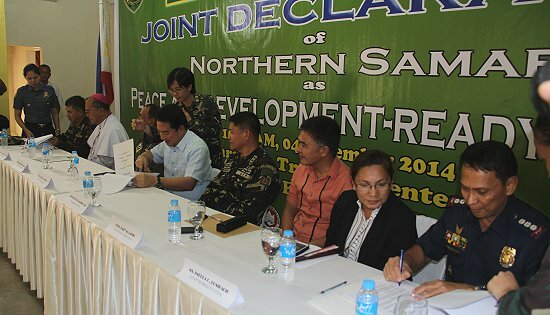 The declaration of Northern Samar as PDRP is the latest milestone in the successful implementation of the peace and development efforts in the Eastern Visayas region. The activity was well-attended by key stakeholders for the peace effort which includes: Hon Jose L. Ong Jr., Governor of Northern Samar; Most Rev Emmanuel C. Trance, Bishop Archdiocese of Catarman; Lt Gen Nicanor M. Vivar, Commander of Central Command AFP; Maj Gen Jet B. Velarmino, Commander 8th Infantry Division PA; Hon Gary M. Lavin, Vice Governor of Northern Samar; Col Heminigildo C. Aquino, Commander 803 Infantry Brigade; Ms Imelda C. Bonifacio, OPAPP Area Manager, and P/SSupt Daniel C. Mayoni, the PNP Provincial Director of Northern Samar. 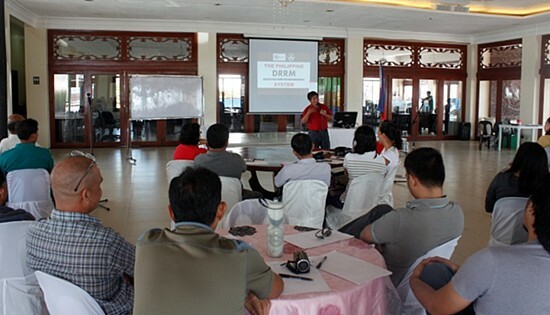 Likewise, the activity was graced by the different chief executives of Northern Samar municipalities, heads and representatives of the different local government agencies and sectors of the society. Hon. Jun L. Ong Jr, Northern Samar Governor expressed his gratitude to the joint efforts of all stakeholders in making Northern Samar as Peace and Development Ready Province. He further added that the successful declaration of Northern Samar as PDRP is also a manifestation of the Northern Samarnon’s desire for peace and development. It can be gleaned that the high presence of insurgents during the past decades caused general fear to the populace and disrupted the normal government processes and activities in Northern Samar. There was also widespread incidence of extortion due to limited capacity and capability of government instrumentalities to enforce their mandate, compounded with the community’s lack of vigilance and/ or fear from reprisals of this threat group. Through several years of combined efforts of the Armed Forces of Philippines, the Northern Samar Police Provincial Office and the Provincial Government of Northern Samar to combat insurgency problems in the province, the province has gained positive results taking into account the fact that no immense armed offensives by the enemy of the state occurred for the past years. The threats posed by the Communist Party of the Philippines-New People’s Army-National Democratic Front (CNN) in the past have been successfully addressed, thus, threats to stability, peace and order have been reduced, paving the way for development projects to eventually succeed. Further, the uninterrupted economic development activities spearheaded by the Provincial Government of Northern Samar, successfully addressed the poverty-induced insurgency through multi-sectoral and peace and development projects. This was coupled by PAMANA interventions in Northern Samar, which focused on making government felt through delivery of social services and creation of economic opportunities. The increased social participation among our stakeholders have greatly increased, resulting in increased productivity, social cohesiveness among the different sectors in the community and regained the trust and confidence of the people in the government. TACLOBAN CITY – The employees of National Maritime Polytechnic (NMP), the premier government maritime training and research center located at Brgy. Cabalawan, this City, underwent a one-day Disaster Preparedness Seminar on November 21, 2014 at the Palo Municipal Multi-purpose Hall. “Disaster is at end of the spectrum by which we have to prepare for. Risks are found everywhere and we have to be cautious about them,” Atty. Ruben Y. Maceda, NMP OIC Deputy Executive Director, said as he welcomed the fifty (50) regular and Job Order Workers who participated in the said training. Aimed at increasing the awareness of NMP employees on how to prepare for disasters and reduce the risks affiliated with them, the seminar focused on topics about environmental and human-related disasters and the necessary precautionary measures to be considered for each with Ms. Cherelyn Lubang, Civil Defense Assistant from the Office of the Civil Defense (OCD), as the Resource Speaker. Towards the end of the seminar, Ms. Lubang facilitated in the preparation of disaster-preparedness plan that may be applied at home or in the Agency. OCD, the civil defense arm of the Department of National Defense, is a government agency in charge of the enforcement and implementation of the regulations set forth by Republic Act 10121, an Act Strengthening the Philippine Disaster Risk Reduction and Management System, Providing for the National Disaster Risk Reduction and Management Framework and Institutionalizing the National Disaster Risk Reduction and Management Plan, Appropriating Funds Therefor and other Purposes. The conduct of the seminar-workshop is one of the commitment activities pursued under the Agency’s Gender and Development (GAD)and spearheaded by its Focal Person Elena M. Santos. NORTHERN SAMAR – Local residents hailed the army’s peace and development initiatives at Brgy. San Miguel, Las Navas, Northern Samar as part of the 34th Infantry (Reliable) Battalion’s Bayanihan Team Activities in the said barangay. According to Lt Colonel Edgar R delos Reyes, the commander of 34th Infantry Battalion, a team from 34IB was tasked to conduct series of peace and development activities in the aforementioned barangay. The team was well received by Hon. Apolinario Levico, the chairman of Brgy. San Miguel, Las Navas, Northern Samar along with other barangay officials and the community. PFC Ruel Oboquin, 22, and PFC Ronie Mameng, 24, of 19th Infantry Battalion, 8th Infantry Division reportedly barged into the Bahada Bar at around 3:45 a.m. Reports said that the two soldiers were looking for someone. When they failed to find the person the workers were rounded up and were forced to reopen the bar. MANILA – Greenpeace today released the results of an investigation into juvenile by catch, showing evidence that ‘baby’ skipjack, yellow fin and big eye tuna are unloaded regularly at the General Santos fish port. The investigation was carried out in the lead up to the annual meeting of tuna stakeholders at the 11th Western and Central Pacific Commission (WCPFC) meeting, currently being held in Apia, Samoa. Greenpeace compiled evidence that confirmed juvenile ‘baby’ yellow fin and big eye tuna are being traded at substantially less than the average size at maturity of 1 meter in length, and even below the weight limit of 500g, set by Fisheries Administrative Order (FAO) 226, which allows the catching and trading of juvenile tunas as small as 500 grams in weight or just tens of centimeters long. Big eye and yellow fin tuna are considered mature and able to reproduce when they are about a meter long. A few months ago, the WCPFC Scientific Committee released information that the current population of the Pacific blue fin tuna is now estimated to be only at 4.2%, and big eye tuna at 16% of its original spawning biomass. “The world’s tuna stocks are in decline and nothing is being done to stop the catching of baby tunas- which are vital in keeping the fisheries alive. This is a direct result of the continued expansion of fishing fleets, and increasing fishing capacity and effort especially through the use of fish aggregating devices, or FADs, by purse seine vessels,” said Mark Dia, Regional Oceans Campaigner for Greenpeace Southeast Asia, and an observer at the WCPFC. “Despite the red alert on big eye tuna, fishing companies continue to fish them like there’s no tomorrow. It is time for the WCPFC to tackle unchecked overfishing and demand that member countries like the Philippines take proactive measures to arrest this alarming decline in the stocks. Failure to do so only relegates the WCPFC to an expensive talk shop,” added Dia. Fish aggregating devices, locally known as payaos, are fishing devices that continuously attract fish and other ecologically related species. When used together with purse seine nets, the catches can be as high as 100% juvenile tuna, together with endangered turtles and sharks. Although the WCPFC has already imposed a four-month FAD ban in the high seas, Greenpeace said this is not enough. Backed by strong scientific evidence, the environmental group said any use of FADs by purse seine fleets is simply unacceptable. Philippine fishing communities are also in favor of banning the use of purse seine on FADs. Small scale fishers who use selective or low impact fishing gear argue that they simply cannot compete with commercial fishing fleets that regularly use FADs which end up depleting fishing grounds, adding to local fishers’ woes. Greenpeace and fisherfolk are demanding that the Bureau of Fisheries and Aquatic Resources (BFAR) urgently reduce the number of purse seiners, to align with sustainable catch levels and allow overfished big eye and other tuna stocks to recover. To tackle by catch of juvenile big eye and yellow fin tuna, the BFAR must also ban the use of fish aggregating devices (FADS) by vessels using unselective fishing gears such as purse seine nets, and create a fisheries administrative order that prevents the catching, landing and selling of juvenile tuna. Together, these measures present an effective strategy to conserve the dwindling tuna stocks. PASAY CITY – Senator Chiz Escudero said there are enough safeguards in the 2015 spending package crafted by the Senate to ensure that lump sum items will be used properly. Escudero allayed fears that the lump sum items in next year’s budget veil pork items for legislators, saying that the Senate-approved budget is compliant with the Supreme Court decision on the Priority Development Assistance Fund (PDAF) and the Disbursement Acceleration Program (DAP), and that measures are in place to deter abuse. He said the High Court itself did not declare lump sum as unconstitutional, only the post-intervention of legislators which the Senate has addressed. Escudero said in Sec. 63 of the GAA lump sum appropriations shall be released upon compliance with the requirements under special provisions which will be submitted to Congress. It shall include the complete details of the programs, activities and projects covering the lump sum appropriations. In the Senate’s budget version, total lump sum items amount to P1.862 trillion. The total programmed appropriation is P1.734 trillion, and total unprogrammed allocation is P123.056 billion. Lump sum appropriations under the Programmed Funds include Contingency Fund or standby fund for unforeseen events, P2 billion; Rehabilitation and Reconstruction Program to complement the expenses based on the recommendation of the Office of the Presidential Assistant for Rehabilitation and Recovery, P20 billion; E-Government Fund for interconnectivity and ICT requirements of all government agencies, P1 billion; and International Committees Fund, P10.7 billion. It also includes P90.4 billion for the Miscellaneous Personnel Benefits Fund or MPBF, which covers the benefits of government workers; P14 billion for National Disaster Risk Reduction and Management Fund; P127.1 billion for Pension and Gratuity Fund to cover the standby fund for those who will retire from government service. Among the items under the Unprogrammed Funds are the AFP Modernization, Additional Subsidy to Napocor, the proposed supplemental budget for Rehabilitation Fund amounting to P20 billion, the P9 billion for MRT3 acquisition, and P3 billion Trade Remedies Fund. “In accordance with the DAP decision of the High Court, dapat may certification muna yung National Treasury na sumobra nga at nadoon yung pondo sa Treasury. In accordance with our provisions on lump sums, bago nila magamit kailangan ipagbigay-alam muna nila sa amin,” Escudero explained. Both the Senate and the House of Representatives will convene for the bicameral conference on Tuesday next week to reconcile their budget versions. PASAY CITY – The Senate has ensured that the new law granting automatic health insurance to senior citizens regardless of their socio-economic status will be funded by next year’s national budget. According to Senator Chiz Escudero, chair of the Senate Committee on Finance, senior citizens are among the sectors that will benefit from the mandatory PhilHealth coverage under a new special provision in the 2015 general appropriations bill, which he sponsored. Also to be covered are indigents and elected and appointed barangay officials, tanods and barangay health workers (BHW). “Volunteer tanods put their lives on the line but receive a token pay. So are BHWs who only get a measly honorarium. The least we can do is to give them health insurance so when they are hurt in the line of duty, the treatment will be shouldered by PhilHealth,” Escudero said. The senator explained that funding for the “full premium subsidy” of the covered sectors will come from a P37.06-billion allocation of the National Health Insurance Program (NHIP) under the government’s proposed spending package for next year. “The continuing role of the government is to remove barriers and provide wider access to healthcare assistance which is a universal basic service,” Escudero pointed out. In addition to indigent seniors and barangay officials, the Escudero amendment mandates the automatic PhilHeath coverage of indigent families identified by the National Household Targeting System for Poverty Reduction (NHTS-PR). Escudero was referring to the Act Providing for the Mandatory PhilHealth Coverage for All Senior Citizens, Amending for the Purpose RA 7431, as Amended by RA 9994, otherwise known as the Expanded Senior Citizens Act of 2010, which President Aquino signed early this month. For 2015, the Department of Health (DoH) has a proposed budget of P89.9 billion, up from P87.1 billion this year. But the total health sector budget, including budgetary support for four Quezon City-based specialty hospitals, the Veterans Memorial Medical Center, and other non-DoH agencies, is P94.6 billion, according to a Department of Budget and Management briefer. PASAY CITY – The Senate will increase by almost three-fold to P3.87 billion the budget for the school-based feeding program of the Department of Education (DepEd) for 2015 to ensure that no undernourished child will be left behind, Senator Chiz Escudero announced. The P2.5 billion increase would allow public schools to accommodate 1.28 million kids more to the program that gives healthy hot meals to malnourished kindergarten and grade school students, Escudero, chairman of the Senate Committee on Finance, said. The National Expenditure Program submitted by the Palace only covered 100 percent of the “severely wasted” or children with severe acute malnutrition, and only 8 percent of the “wasted” in the nutrition scale. But under the Senate amendment, Escudero said, both categories will get 100 percent coverage to increase the total number of beneficiaries to 1.92 million, with the bulk coming from the “wasted” category at 1.38 million. “As amended by the Senate Committee on Finance, it will cover 100 percent of the ‘severely wasted’ and 100 percent of the ‘wasted,’” Escudero explained during Wednesday’s floor deliberation on DepEd’s spending plan. The increase, he pointed out, will guarantee that “no undernourished child will be left behind” in the government’s school feeding program. “Pati pondo kasi para sa pagkain ng mga bata sa paaralan ay kulang din. There is also such a thing as budget malnutrition. So dinagdagan namin ng pondo,” Escudero said. If the DepEd’s amended school feeding budget of P3.9 billion will be added to the P3.36 billion that the Department of Social Welfare and Development (DSWD) will get next year for a similar feeding program, “then the total money available for this activity next year is about P7.3 billion,” Escudero said. For its feeding program, the DSWD targets to give one meal for four months to some 2.05 million pupils under 5 years old who are enrolled in daycare centers or neighborhood nurseries. CATBALOGAN CITY – Government troops seized several Improvised Explosive Devices in the hinterlands of the Municipality of Basey, Samar in the afternoon of November 19, 2014. According to the report of Lt Col Miguel E. Ceballos, Commanding Officer, 20th Infantry Battalion, 8th Infantry Division, Philippine Army, his troops were conducting security operations in the vicinity of Sitio, Bega, Barangay Mabini, Basey Samar when some residents tipped-off the presence of suspicious wires laid along the trail in the outskirt of the said barangay. According to the residents, they believe that these wires are part of several IEDs planted intentionally to inflict casualties to government troops operating in the area. Further, the civilians' safety is threatened as these will also destroy innocent lives and properties. Guided by concerned residents in the locality, the soldiers went to the said area and were able to recover twenty (20) sets of Improvised Explosive Devices (IEDs). As of this time, government troops continue to scour the area for possible presence of more IEDs in the area. Meanwhile, Maj Gen Velarmino, Commander of the 8th Infantry Division extended his gratitude and thanks to the civilians who provided the information to that led to the successful recovery of said explosives. He further added that the action of the NPA is a clear manifestation that they violate the provisions stipulated under the Geneva Convention on the use of land mines in armed warfare. Velarmino further added that the 8ID under his leadership will stop at nothing in order to attain Peace and Development in Region VIII which is the dream of every Samareños in the region.